Zamperla's Power Surge has been one of the most successful one-trailer rides in the industry's history. It holds twenty-four riders and spins them head-over-heels many different directions. 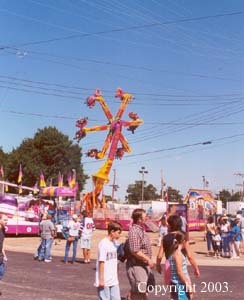 A Tilt-a-Whirl from Sellner Manufacturing, a midway classic, is in the left-hand corner. The White Water Log Flume was built by Gaston Reverchon Industries of France. 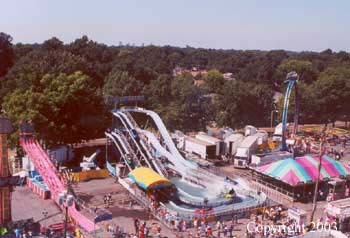 Because of the number of trailers required for travel the portable flume is not a common sight on midways in the United States. The Banzai comes from Fabbri. It is a Kamikaze 2 and takes two arms full of riders upside down. 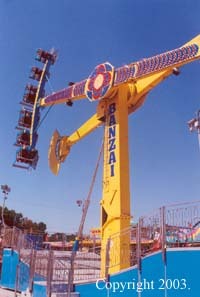 The ride is a much-improved version of the company's old, enclosed Kamikaze ride. This shot of the midway shows the Kamikaze and the Afterburner (to the right). 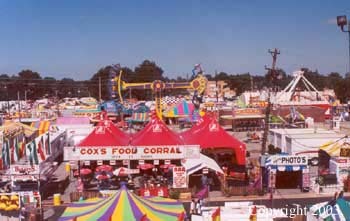 In the foreground are some of the many delicious food stands open for business.